A Maine Forest Service helicopter carries water to the scene of a fire at the Ideal Recycling Inc. in Carmel Monday afternoon. More than dozen fire departments and the National Guard battled a blaze at Ideal Recycling in Carmel on Monday afternoon. 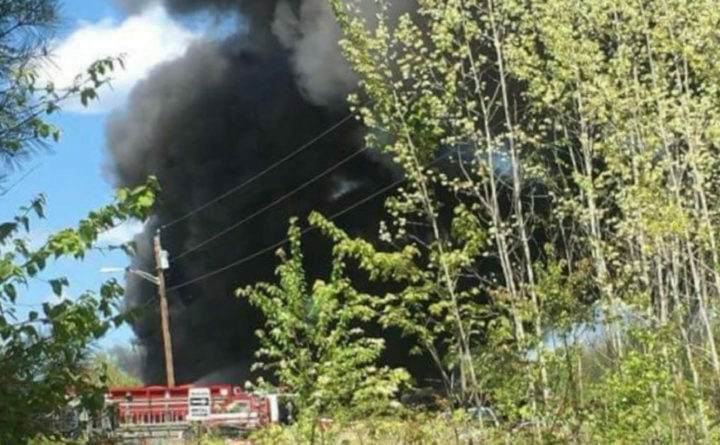 Route 2 in Carmel was closed Monday afternoon while more than a dozen fire departments battled a massive fire that reportedly broke out at Ideal Recycling, Inc.
A report that tall flames enveloping a row of cars “100 feet wide” at the Main Street recycling yard came in at 11:25 a.m., according to a Penobscot County dispatcher. No other information about the cause of the fire was immediately available. During the afternoon, a total of 16 fire departments from Plymouth to Bradford were either at the scene or covering for each other, the dispatcher said. 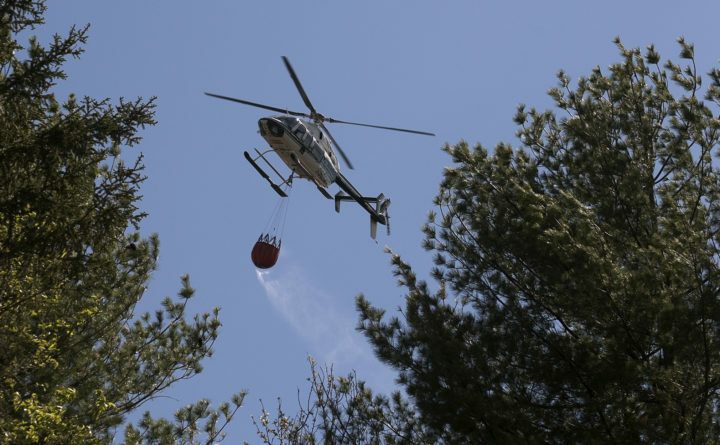 The Maine Forest Service also assisted, and helicopters dropped water on the site from above, the service said. Members from the Salvation Army emergency disaster program arrived around 12:30 p.m. to provide meals and refreshments to firefighters, the organization said. By 4:30 p.m., the fire had been contained to the recycling plant property and had not spread to the surrounding forest, said Jeff Currier, regional forest ranger. Had it spread, it would have threatened the surrounding homes, he said. The fire itself was largely obscured from view and set back about 200 yards from Main Street, or Route 2. The road was still closed as of 5:30 p.m., according to a Penobscot County dispatcher. When the blaze erupted, it sent up a black mushroom cloud, according to a witness. The dark pillar of smoke faded as the day wore on but remained visible on the horizon for miles. Monday’s fire isn’t first time the recycling plant has been the site of an impressive blaze. In 2013, oil sludge at the bottom of a 100-gallon tank that had been dropped off at the facility caught fire when workers cut the metal with torches. It took four hours and seven fire departments to knock down the flames.